Quickly and easily traces branch circuits. Easy to read LED display. Not affected by line noise including computer, dimmers, etc. Works on lines with 24-300 VAC. 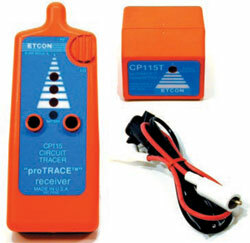 Includes "proTrace Receiver", transmitter, instructions and carrying case.